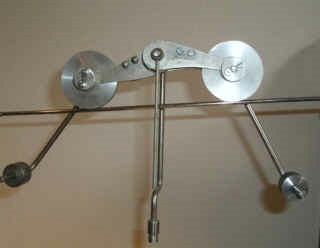 Similar to the funambulist piece "bicycle on a cable", there' s a caterpillar roosting on a rod on its two pulley wheels. As with the circus piece, a hanging counterbalance hinders caterpillars toppling. The counterbalance swims in a pool. Waves are excited. 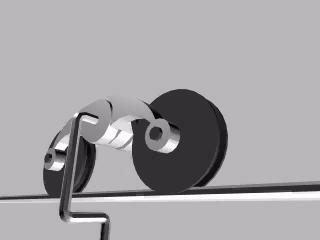 Their movement is transmitted by the swimming counterbalance to caterpillar's center where the distance between the two wheels alternately is reduced and increased, the wheels like ratchets being able to roll in one direction only. The caterpillar creeps.